Potato waffles are one of those things that always remind me of being a kid. 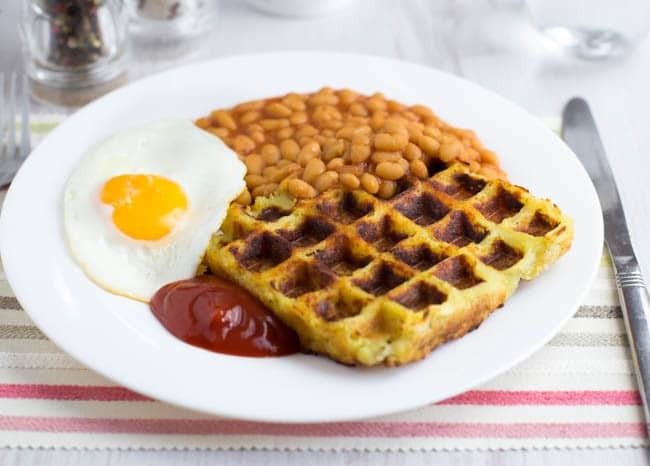 A potato waffle served with baked beans, maybe a couple of veggie sausages or nuggets, or just a fried egg – the ultimate childhood dinner. These days I usually try to make sure my dinners contain a bit more greenery than this, but occasionally it’s nice to revert to an old favourite. And since I apparently like to torture myself, this time I decided to make homemade potato waffles from scratch. 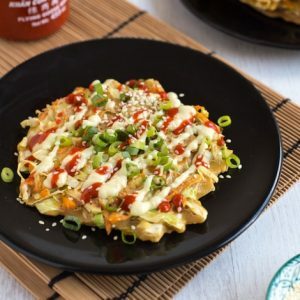 As long as you have a waffle maker, homemade potato waffles are pretty easy to make! Cook the potatoes first (I just threw them in the microwave), then grate or mash them up. Make sure you let them cool down for at least a few minutes before attempting to handle them – there’s a reason that in the game ‘hot potato’, you’re not allowed to hold the object for very long. Those babies get hot (and I have the sore fingertips to prove it). 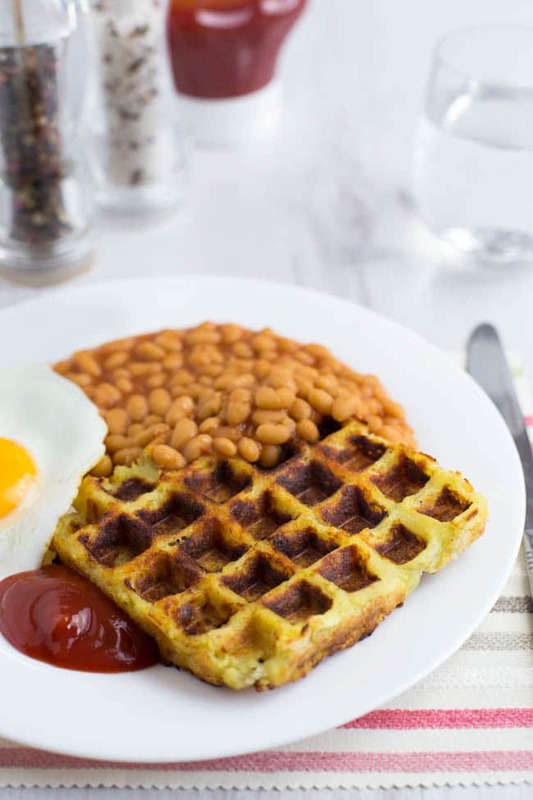 The key to making your homemade potato waffles really tasty is to add plenty of seasoning and flavourings. 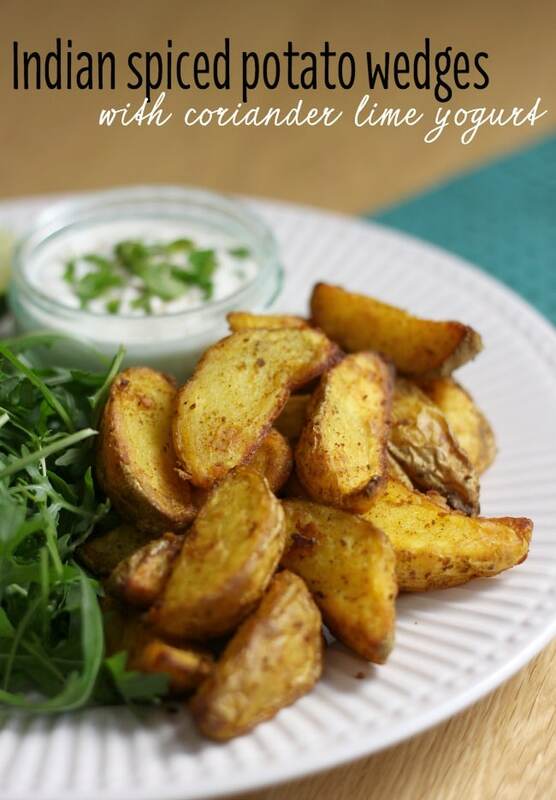 Plain potato doesn’t have much flavour on its own, so add a generous pinch of salt and pepper, and a bit of garlic powder too if you like, or whatever other dried herbs or spices you fancy. Then just cook the potato in your waffle maker until they’re nicely browned. The waffles end up nice and crispy on the outside, but inside they’re still soft and fluffy. These homemade potato waffles definitely require more time and effort to make than the shop bought version, but they’re lovely for a slightly more exciting treat once in a while. 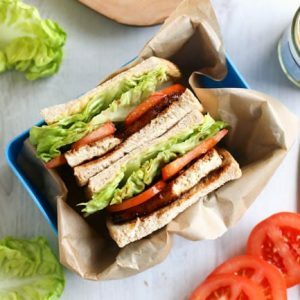 If you’d like me to attempt to recreate any of your favourite childhood dinners, let me know in the comments – it was quite nice taking a little trip down memory lane! Prick the potatoes a few times with a fork, and cook in the microwave until they're fairly soft. Cut them in half, and allow to cool for at least 5 minutes. Then, grate or mash the potato flesh - you may want to remove the skins first (if you choose to grate the potatoes, the skin should fall away as you grate). Add the grated or mashed potato to a large bowl, and add the flour, garlic powder, and a generous amount of salt and pepper. 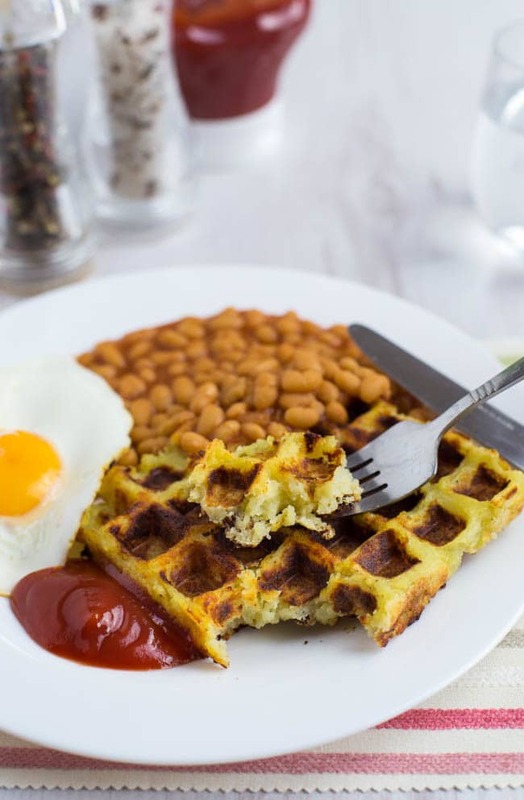 Drizzle or spray some cooking oil into a waffle maker, and distribute the potato mixture into two waffles. Add a little more oil on top. Close the lid, and cook until the waffles are cooked to your liking (around 5-10 minutes). 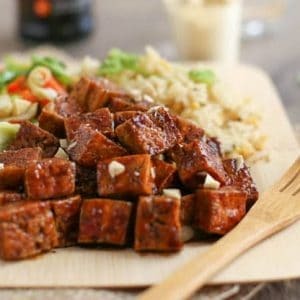 This recipe looks great, as well as all your other recipes. 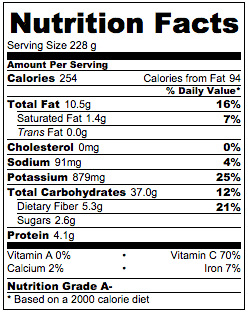 I just bought sweet potatoes in bulk and need to use them up. 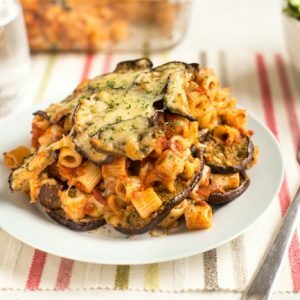 Would this recipe work with sweet potatoes? That’s a great idea! 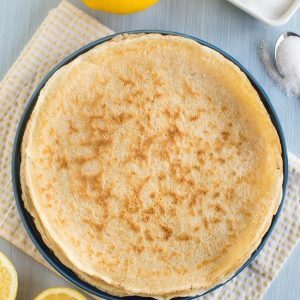 We never thought of it, but it looks really easy and delicious! Have to try it ine of this days after making some paella at work. Cheers! 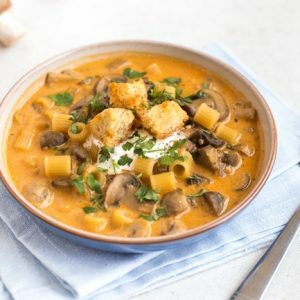 Oh wow, never thought of making these but am convinced they would be a family favourite and I would much prefer to make than buy them, love this idea! That’s a rather weird combination, don’t you think? Haha no, not really! 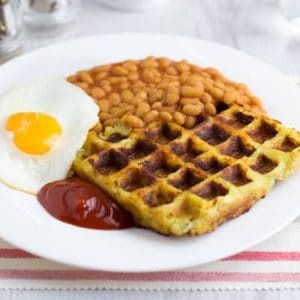 Potato waffles with beans is a pretty common combination, and I like to eat eggs for extra protein. Not that weird! 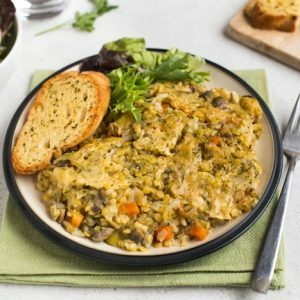 I think they’d be great for breakfast too, with some sauteed veggies and a fried egg! I have never made gold old potato waffles at home. I had not even considered it. Now I just HAVE to..
Ingenuous. Nice to see baked beans aren’t out of favour either. I… have never heard of potato waffles! I mean, I’ve heard of waffling hash browns or what have you–but my education was apparently lacking! After more than two years of wanting a waffle maker, I literally only picked my new toy up today. 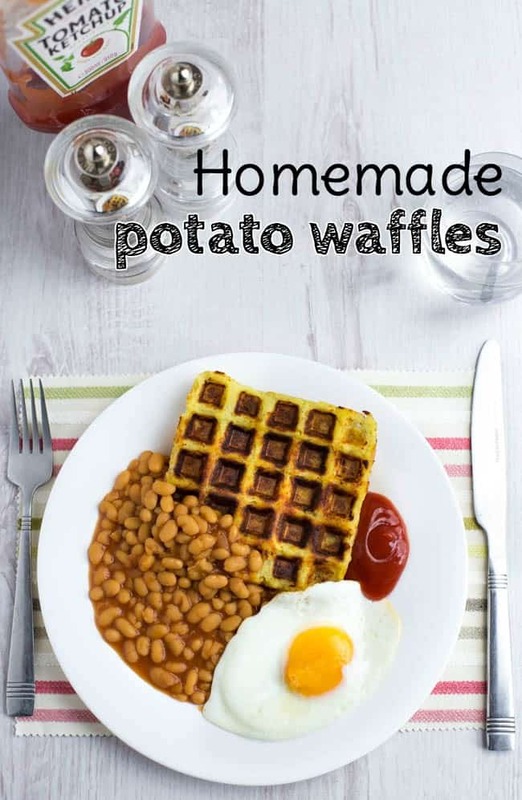 I’ve been gathering waffle recipes of all sorts since I placed the order so I’m extra pleased to see this come up on Facebook!